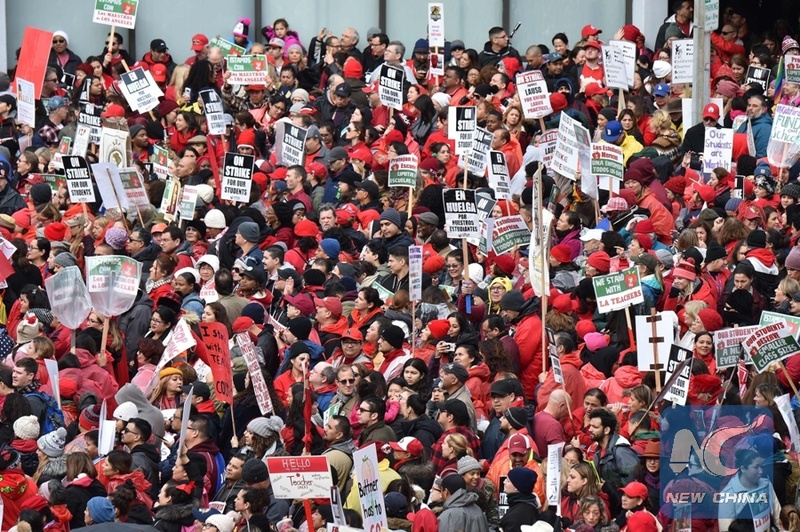 LOS ANGELES, Jan. 15 (Xinhua) -- Los Angeles schools lost 15 million U.S. dollars on the first day of the teachers' strike, said Los Angeles Unified School District Superintendent Austin Beutner on Tuesday. Beutner told a press conference that only one-third of the district's students showed up to school on Monday - the first day of the teachers' strike. That cost the district around 25 million dollars in state funding, which is based on student attendance. Since the district is not paying the striking teachers, that saved around 10 million dollars, making it a total one-day loss of 15 million dollars for Los Angeles schools, he said. More than 32,000 Los Angeles teachers and staff took streets on Monday to demand smaller class sizes, more support staff at schools and better pay. It was the first strike of Los Angeles teachers in 30 years. The strike came after weeks of heated negotiations between the United Teachers Los Angeles union and the Los Angeles Unified School District went nowhere.